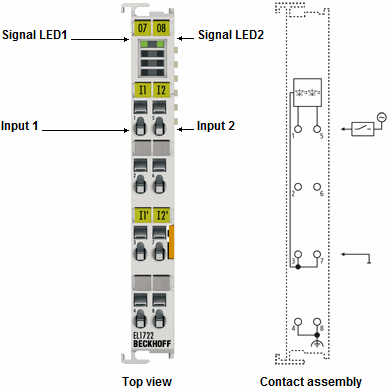 The EL1702, EL1712 and EL1722 digital input terminals acquire the binary control signals from the process level and transmit them, in an electrically isolated form, to the higher-level automation unit. 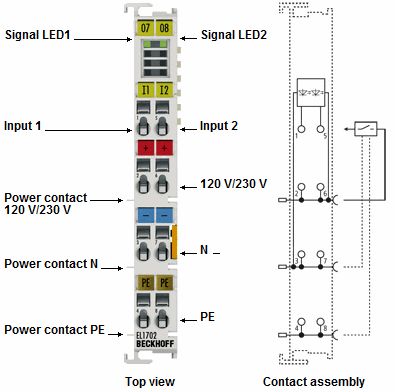 It is possible to connect 120 V/230 V AC actuators directly. 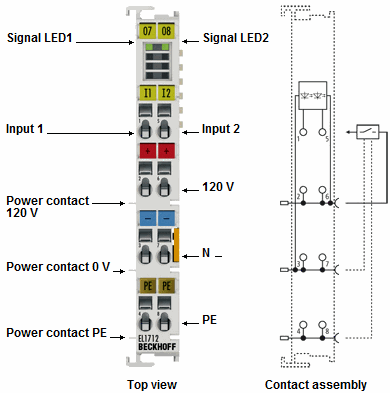 The EtherCAT Terminals contain two channels that indicate their signal state by means of light emitting diodes. The EL1722 version does not have any power contacts. This makes it possible to create individual potential groups. The voltage between input 1 and input 2 must not exceed 230 V AC. The EL1712 is also suitable for 120 V DC. Electrical isolation 500 V (E-bus/mains voltage); 3,750 V AC, 1 min.